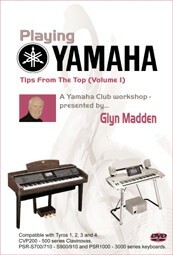 Yamaha artist Glyn Madden answers some of the most frequently asked questions in a treasury of hints and tips from the Yamaha Club's archive - presented as a series of easy to follow mini-workshops and step-by-step demonstrations. Choosing a sound for your left hand. Mixing and matching style parts. The 'hidden' sounds in your keyboard/Clavinova. Building sound effects into a performance. Using footswitches in a performance.